Long time staff member and current program director Dan Farrell has been selected for induction into the Drum Corps International Hall of Fame. The DCI Hall of Fame honors individuals who have left an indelible impression on the drum corps activity. 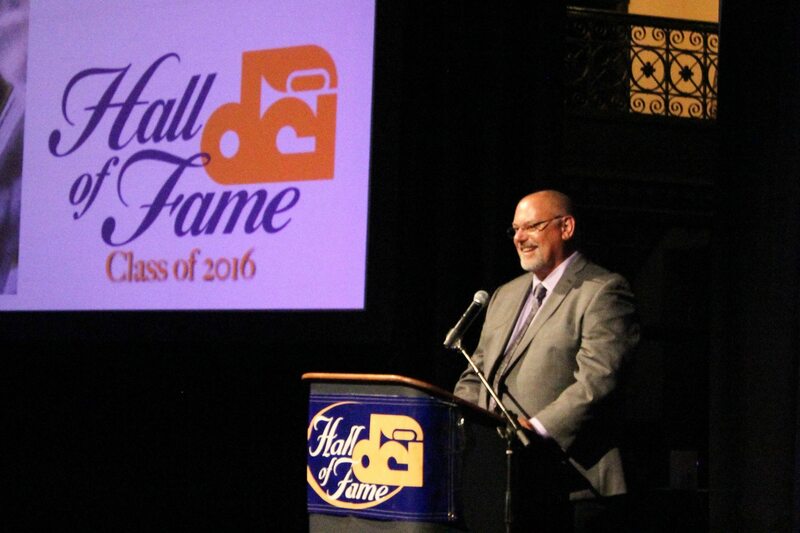 The Hall of Fame induction ceremony took place on August 10, 2016.View Dan’s induction ceremony below. Farrell has made his mark at the highest levels as a performer, instructor and caption head, and his influence on the activity as a program coordinator is without question. He joined Phantom Regiment as a 12-year-old, along with an older brother, in the fall of 1971 at the urging of his father. No one could have anticipated the impact it would have, not only on his life, but on the organization he has called home for most of the past 44 years. As a performer, Farrell was part of the rise of Phantom Regiment from a struggling local corps to DCI finalist to DCI championship contender. He was a baritone soloist in the mid- and late-1970s as well as a DCI Individual champion during that time. After aging out as a performer in 1980, Farrell would join the brass staff under the mentorship of future DCI Hall of Famers Jim Wren and Dan Richardson. He became caption head for the 1988 season and, a year later, the corps won the high brass award while placing second in finals. The powerful hornlines continued under his leadership through 1992. It was prior to the 1993 season that Farrell took the reins as program coordinator, and the corps hasn’t been the same since. Other than two seasons off at the end of the 1990s, he has been the heart and soul of Phantom Regiment. He immediately made a statement as program coordinator in 1993 with a show titled “The Modern Imagination” that was everything the fans expect from Phantom Regiment but in a new, sophisticated style. Music unknown to most was turned into one of the most electrifying shows of all time that had the crowd on its feet multiple times during the show. In 1996, “The Defiant Heart” became one of the most musically powerful shows the activity had seen and it led to the corps’ first DCI World Championship. Another string of immensely popular and diverse shows followed in the 2000s: contemporary music in 2003, tango music in 2004, Gershwin in 2005, the visual and musical feast of “Faust” in 2006. And then came 2008. Farrell and his team came up with one of the great shows in DCI history, “Spartacus.” It set a new standard for storytelling and crowd involvement (20,000 people yelling “I Am Spartacus”) in DCI and created one of the loudest audience reactions anyone had heard. Phantom Regiment executive director Rick Valenzuela wrote in his nominating letter the numerous contributions Farrell has made to the activity, and the Regiment. “Dan Farrell has been the creative heart and soul of the Phantom Regiment as far back as I can remember, he’s one of the best in the activity,” said Wayne Downey, DCI Hall of Famer and long-time brass arranger for the Blue Devils. Quite simply, Phantom Regiment and Dan Farrell have been synonymous for decades, and the impact Phantom Regiment has had on the drum corps activity is because of Dan. We also like to congratulate the other members of the 2016 DCI Hall of Fame Class including: Denise Bonfiglio, Frank Dorritie and Myron Rosander (who was also our visual designer in 2010). Read more about them here. View all the members in the DCI Hall of Fame here.